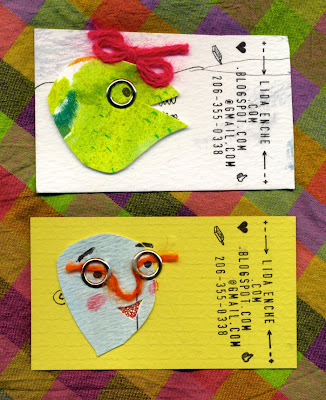 In excited anticipation of the SCBWI Conference, I have been hand-making business cards. Instead of another piece of mass-produced slog, why not give away a little piece of art - something made by hand, with care and a sense of humor? It's also a liberating opportunity to cut up reject illustrations that have been hanging around my studio like a pesky itch that won't go away. After all - creativity and art is like Warm Fuzzies - the more you give away, the more you have.